Design director, Jasper Sanders, chats with us about the fitness suite design they were commissioned to create, located in a basement car park. When we realised the only suitable space for the fitness suite was in the basement car park, we knew we needed to inspire people to go there. The design needed to be engaging and compelling. Why did you choose BAUX products? The colours and texture of BAUX wood wool tiles offer something unique. They absorb sound reflections and the colours transformed a concrete underground space into something comfortable and welcoming. How did colour transform the space? We chose to use pink because it’s playful, brings energy and feels fresh. Most gyms feel like they’re designed exclusively for men. 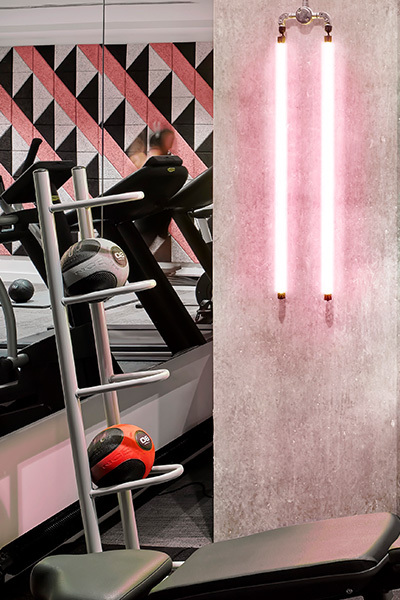 We wanted to balance the masculine feel of clunky gym equipment, so we pinked up the space! Given the underground location, the design team wanted female residents to feel exceptionally safe and welcome. We thought about creating our own pattern but there are just so many lovely patterns in the BAUX pattern tool, we quickly found something that we loved. Combing colour with natural textures transforms hard concrete surfaces into a tranquil energizing space. What’s your dream BAUX project? It would be really interesting to integrate BAUX with furniture design to create shapes and contours that enhance people’s experiences and interactions. 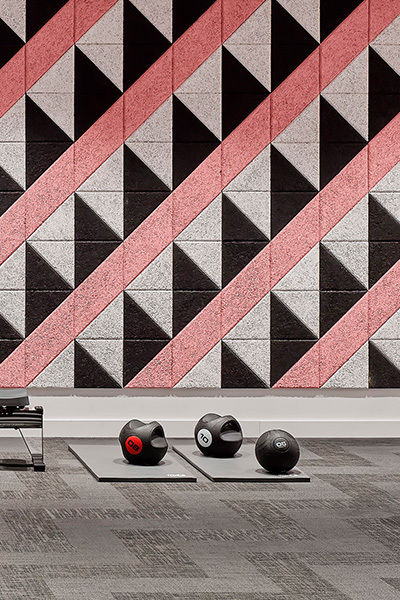 Learn more about the Fredrick House Gym case created by Jasper Sanders and the team at Jasper Sanders + Partners, or visit our project references for other BAUX acoustic interior design projects.